Ted Hayash and Mitchell Ball went to NAB 2016 on a mission to find the best new tools of the coming year. Here’s the notes from the debriefing. Ted: Tons of HDR – High Dynamic Range – imaging. I finally get it. We’ve been stuffing the 14 to 16 stops of latitude that the cameras now capture into a box called Rec. 709 that only holds 5 1/2 stops. All the major manufacturers like Sony and Panasonic and Canon are building consumer tv’s that can display Rec. 2020, an expanded color space that will show off what the camera can really capture, and in 4K UHD. 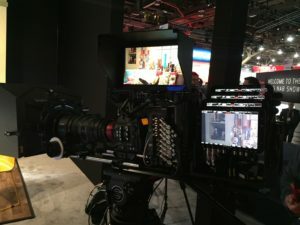 Canon was even showing a prototype 8K camera that used 4 4K recorders to capture a raw signal and output it to an 8K monitor. You might ask “who needs all that detail?” but cinema is meant to be a transformative experience and an 8K image, one that appears to be sharper than reality, is certainly that. We’re moving from Georges Seurat, who reduced the level of detail in his pictures, to John Baeder, who’s paintings have a very high level of detail but are still transformative. M: It’s like going from reversal to negative. T: That’s a good way to think of it – it’s like we’re getting new print stocks that have much more latitude. Mitch: WCU4 from Arri for the sheer amount of capabilities packed into a simple follow focus unit. It’s got a lot of room to grow and expand it’s capabilities. Everything is starting to have more data, and the WCU4 allows you to get data from your lens in real time and to save that data so you can use it again for post etc. Everything is getting more precise and flexible. I liked the BBS Lighting booth – I liked their new 4-bank tube fixture. You can put this unit up closer to the walls and it still has a great quality of light – it’s soft and accurate and controllable. Ted: We’re probably going to put some of those in inventory soon. What did you think of those BBS light pipes? They’re really bright. M: I liked those, they’re a rigid bright LED tube that’s light weight and doesn’t use much power. T: Plus it has great color. They are using the remote phosphor technology in all their units so the color is very consistent from unit to unit, and they have really high CRI. M: It’s like those times when you just need a single Kino tube but brighter and less power and less equipment and easier to mount. Plus it’s fully dimmable. T: There were tons of new ways to move the camera – so many it was overwhelming. M: Lots of motion control. RED had a crazy one that was small and versatile, like a snake. It seemed easy to use and program. T: What was the interface? M: All kinds of interfaces – there was one that used a PS4 controller. M: The Dedo booth had some nice stuff, but the power supply was more weight than the light itself, which was off putting. Dedo light mobile DLED. T: I’ve always liked those units – they work really nicely. It’s really nice to have daylight versions of our favorite lights. I’ve used them on some toy spots. M: We had them on the Turner shoot last fall too. T: The output is regulated so you always have perfect color. T: I was impressed with ETCs ColorSource Relay, which provides wireless DMX at the base of a S4 and is compatible with the ShowBaby system. It’s nice that wireless DMX is becoming more common and compatible. M: ETC had a nice console that was touch screen and let you move your lights around on the screen so you can map your set really easily. It was also RDM capable so that it knows which lights are on the set as soon as they’re plugged in. M: Skypanels and L7c – we really should buy some of those so that we can complete the LED solution we started on stage with our ETC lights, our Area48s and Briteshots and Aadyntech Punches. T: You’re right – I got Arri to quote those lights for us, and of course they’re on back order. But we’ll get them in as soon as Arri brings more into the USA. Of the stuff I saw, most of it applies to the future. M: Most of the camera stuff isn’t really ready for prime time, but is really interesting. Did you see Angenieux’s lightweight Anamorphic zoom? T: Is that the convertible one, the one that goes from anamorphic to spherical in 30 minutes? M: It was rear lens anamorphic so it didn’t have the artifacts that many of the lenses have but it has the clean Angenieux look. M: The KipperTie OLPF’s were interesting. T: Yes, I wanted the infrared version for a shoot this weekend. M: I gotta go. I have to receive some new LiteMat from LiteGear that just came in. T: Busy busy. Just the way I like it. Tell us what you think. Leave a comment, connect on Facebook, or hit the button below.